Place UK specialise in the growing and processing of fresh and frozen fruits to supermarkets and manufacturers respectively. As the Managing Director, Tim Place is the 3rd generation family member to run the company at Church Farm, which was started in 1922. 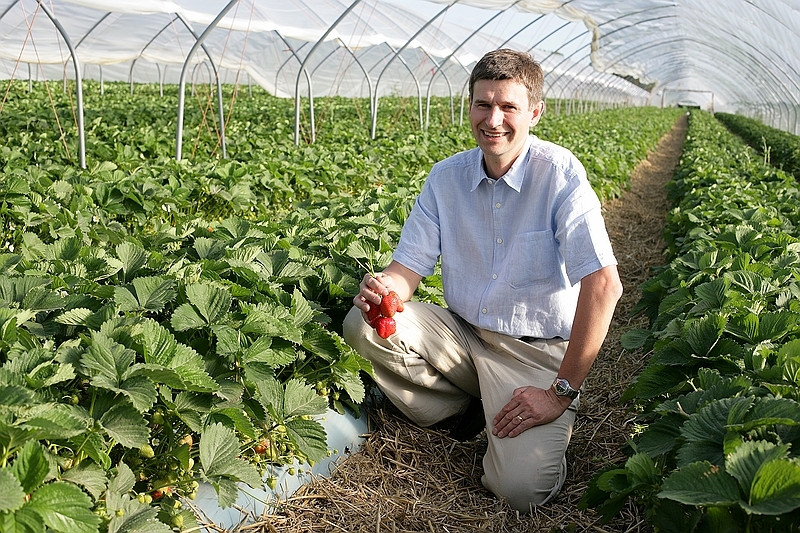 Tim's father, John built the soft fruit enterprise of the business and recollects in 1937 supplying Raspberries and Strawberries to King George’s garden parties’ at Buckingham Palace. Church Farm is located near to Norwich, close to the Norfolk Broads and covers 900 acres specialising in soft fruit as well as rhubarb. The company has a turnover of £15 million and employs 63 full time local staff and up to 450 seasonal staff and was awarded a prestigious “Best Employee Facilities” by a major multinational retailer. The success of Place UK is due to the quality of its people and of their produce, which is achieved by accurate monitoring inputs to the plants. The methods used are not only economically beneficial, but also have extremely positive environmental benefits. For example the crops are watered and fed with nutrients through trickle irrigation pipes laid directly beside each plant, so the risk of nutrient and water loss to the soil is greatly diminished. The company has won two awards for water efficiency from the Environment Agency one for the amount of water they recycle and secondly for their irrigation monitoring and scheduling, which only adds the optimal amount of water at the correct time to ensure the best yield and quality of fruit. As well as the fresh offering Place UK also grow specific varieties of soft fruit for freezing and puree (rhubarb, strawberries, raspberries and blackberries) which is frozen on site through BRC “A” Grade version 5 accredited specialised freezing tunnels within hours of picking. Place UK also blanch and freeze a range of pulses and pasta as well as vegetables to an IQF standard.